1 - How to order? First create your user on the register page. Then do the order on the product webpage . Please add your user name when you do the order. The device will be assigned to your usernamene from that moment on. Write us or call if you have any problem doing it. 2-	I did the registration after the order, it's possible to assign my user name to my device? Yes, of course. The devices will be assigned to the username requested by the owner. It's possible later to change the username in case the device gets a new owner. Your ID document is asked to clear any miss understandings for all persons involved. Contact the support, yoy will get all the help you need. 3-	How do I configure the Imp/KWh parameter for each sensor? On "My ePower" section then "Device". You can configure there the Imp/KWh, enable each channel, get friendly names for the device and sensors. 4-	Will the device work when I have a power failure? Device must have power to work. The only way to work is to have a UPS sourcing the device. In that situation, samples data will be sent to server sooner or later. 5-	The device will do readings when internet link is disconnected? Yes. Costumer's data is our priority. You have our word. On the next 18 hours after an internet break the device will store all samples with the same precision. The samples will be sent to the server as soon as the internet links comes up. 6- What is the best option, 9 or 18 hours of data retention? Normally 9 hours is enough. But it's up to the costumer do choose. 7-	Do I need internet to see the real time power? Yes. It's better to have a good internet link. The user knows the delay of the last sample for each sensor on the real time tool on "My ePower" section. 8-	What's the difference between the epower solution and other systems that use only current transducers attached to the power wires? Witch one is more simple to install? It would be more simple to install the system that uses current transducers. However, with those systems you will get different information. Costumer shell be clarified witch information he gets. The current sensor systems get apparent power measurements (Pap). The bill from utility company won't ask you to pay this power. Thhat means the utility meter installed on electric power distribution wall does not count for that. 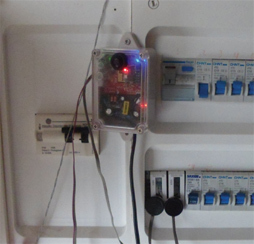 On other hand, our ePower solution measures the power/energy that goes through any electric meter that has a flash/led. Those flash/led meters get real power/energy measurements (Prel), the one that comes on the end user bill. 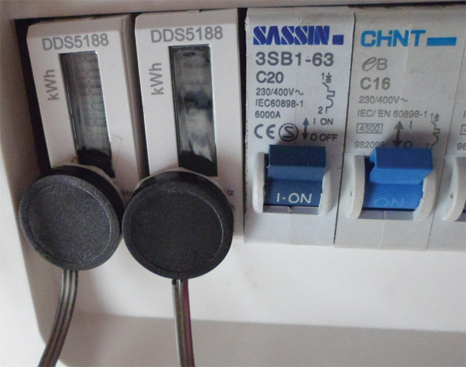 Costumer who uses the current sensor systems will get wrong measurements because they are not getting real power samples but apparent power instead. 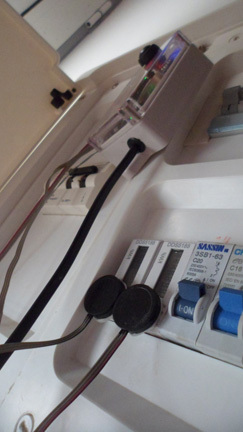 The difference between Pap and Prel depends on each equipment used inside the user power grid each second. Air conditions, motors and any equipment with inductors will generate big amounts of apparent power, for example. 9-	How the sensors instalation are done? It's very simple. the sensors have glue strip attached. Just remove the paper form the strip and glue each one to the counters. 10-	Who big is the difference between those Apparent and Real power? It depends on the machines you have connected in your power grid. To be clear Pap is measured in VA and Prel in W. You can see a graph bellow where those 2 powers were measured in a Portuguese house as example. The above measurements were done on a house with 500W solar panels installed with and 2 x 250W grid tied inverters. Moreover, this house has other equipments like: roof lights, 1 microwave, dish and cloths washing machines, 1 fridge, electric heaters, electric cooker, electric oven, 1 a/c , several computers, mobile phone chargers and so on. We have samples during 12 hours. 1- As you can see, there are moments where those 2 powers are different. The yellow line shows this difference. This is first error: the real time power. 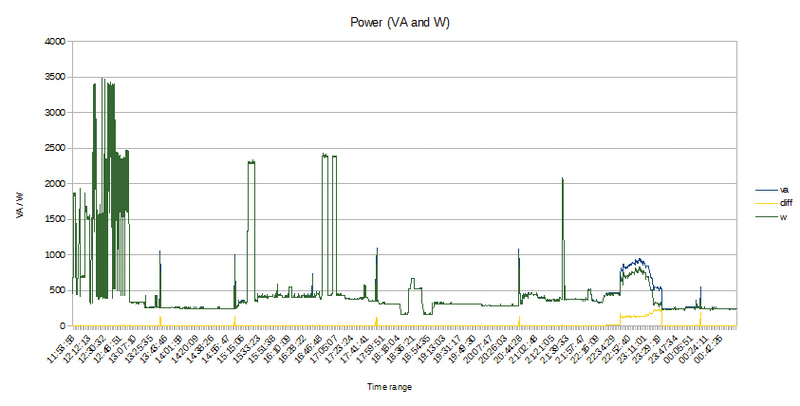 2- Next we calculate the energy spent during those 12 hours, we got Real Energy 6662,2Wh and Apparent Energy: 6824.4VAh. If we consider that VAh=Wh (as you do for systems that use current transducers only) the difference between those 2 measurements is 162Wh. That's the second error: energy calculated. It could not be guessed how big this errors would be if those measurements were done on other day or in a big time range window. The reason for that it's related with the kind of equipment used and how many time they will be on your power grid. PS: The measurements above were done using a Power Meter UT233 from UNI-T.
11-	I want to monitor several branches on my power grid or I want to measure power indepentently from utility company (not using utility meter). How I do that? You need install one counter with flash/led for each branch you want to measure. For example, those ones do Real Power measurements and they have flash-led. 12-	How do I configure the ePower device to connect to my Wi-Fi network? It's explained in user manual. The user manual will be available as soon as you buy the device in your "My ePower" section. 13-	What is the time gauge and the precision of each power sample? The time gauge is 15 seconds. For the precision, our device calculates power, energy and cost when it detects a flash led. On very low power situations (ex. P<100W if Imp/KWh=2000) the time between flashes can be minutes or hours. On those situations the power calculated will suffer an aproximation and will be updated on the next samples as soon as it gets the next flash from the counter. About the graphs, the 15Min. time range shows all samples as they were received from the device. On other time ranges (hour, week and month) it's done a re-sample reduction and average it so that user gets a good usability experience. 14-	How it's calculated the "KWh Counter" that appears on the "COUNTERS" section? It's sumed up all power samples from the start date until end date, as it's configured on "Rates" section. After this it's multiplied by 15 sec time fraction (converted to hours). If you want to count for injected power feed in public grid, please select "Difference" channel and enable that option. On that situation it will sum up all samples when channel "Y">"X". Otherwise it's ignored those samples. 15-	I only need 1 sensor, can you sell the device with 1 sensor only? Yes, you can choose how many channels you want the device and it will be sent as your request. In config. section, you can disable the channels you do not use. 16-	I have more than 1 device, how I manage all of them? You can see how many devices you have on "My ePower" section. You have access to graphs, download .CSV files and configuration for each device after you select it. 17-	Who did this ePower solution? It was done by ecoMotores.com. Both the electronic device that gets the samples and this data management platform you are acessing. This is one of their several creations. You can contact them at "Contacts" section on this website. 18-	Is it possible to remove some data from graphs? Yes. If you did wrong measurement or just want some samples to be removed, please drops us an email explaining that and the time range you want to be removed. You will get this done. 19-	I would like to see other kind of graphs. It's possible to do it for me? Yes, it's possible. You will get an assessment done on your requests to find in what way you can have what you need. Drop an email to support to discuss this with.